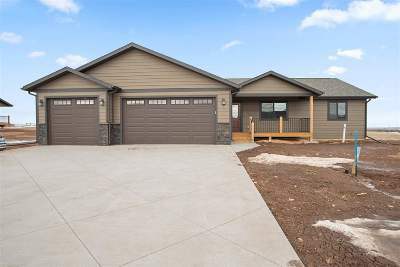 New Construction with beautiful views of the Black Hills. This 3 bedroom, 2 bathroom, 3 car garage home has much to offer. Fully finished has the potential for 5 bedrooms and 3 bathrooms! The home has an open concept, vaulted ceilings, double sinks in the master bath, and main floor laundry. The home also includes wood cabinetry with soft close drawers, stainless steel appliances, and granite vanity counter tops.